The 6th instalment of the Repsol 10 Mile Tri took place today and once again I was reminded of why this race is so awesome! It’s in February (sometimes March) which is when we triathletes start to get antsy to string it all together. This is great time to do an assessment of your fitness and determine if training intensity and / or volume need to tweaked. The distances in each discipline are super: 500m swim, 12.5k bike, 3k run. This makes for a very manageable Sunday brick workout! You get to come together with training partners, teammates and friends to race and support one another. 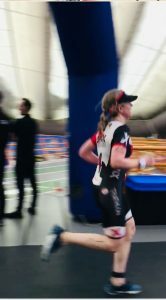 You get to test out some of your tri gear and also work through transitions in a relaxed, low pressure, race environment. There are heats so that you can swim with people of similar ability. You have the option of bringing your own bike and using a trainer that is provided or you can opt to ride on a spin bike. Today I participated for the third time in three years and had a good day. I like to repeat events to try to improve on my prior performances. This might mean going faster (beat prior year time in any or all 3 disciplines and transitions) or it might be to improve upon aspects of the “process of racing”. Examples of this include hydrating and sleeping better the week of a race or trying out a new pre race meal or dialling in on race day nutrition etc. 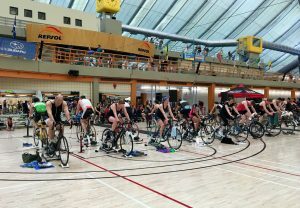 I was in a later heat so I got to support LYNX athletes, club members and friends as they prepared and raced. I did remember to eat and drink throughout the morning and I rolled my calves and glutes but I lost track of time. When I heard the ten minute warning for my heat I was setting up my bike and transition. I quickly ran off to change, made a trip back to grab stuff and turned on my Garmin. Made it out to the pool deck at the two minute warning. Too tight! Cap went on, figured out the swim order with lanemates, did some arm circles and then hopped in the water. (Noted that this was way too rushed and I need to stay on top of time next year). Beeper goes off, start swimming and about 20m in I realize I do not have on my timing chip. Process change for next year and note to readers – put your chip on when you get it! At the 50m mark I stopped and told the timer I didn’t have a chip hoping they could note my swim time and get me a chip for the bike. If you’ve done this event before, you know that 12.5k on a trainer is a lot harder than you think it’s going to be! It’s on average 25-35 minutes of hard effort and it truly is a sufferfest. In past years I’ve really struggled mentally pushing hard from start to finish on the bike and the heat has been an issue too. This year I tried something new and it worked! I soaked my transition towel in cold water and put it around my neck when I started to overheat. I also used it to wipe off my face. Yes, the bike leg still put me in a deep dark pain cave but at least I was a little cooler which helped me stay stronger mentally. I would do this cool towel thing again. Last but not least is the 3k (15 lap) run upstairs on the track. I set a process goal for this leg. My goal was to try to run at a steady pace (without looking at my watch) where I could still smile. To help keep track of your laps, when you complete five, you are handed a rubber band. It’s amazing how this small gesture gives you such focus! All I thought about (and I heard the same from other racers) was counting to five and looking forward to getting that rubber band on my wrist. “Chunking” like this during hard efforts is a helpful strategy. Looking at my run splits afterwards, I was very steady for km 1 & 2 and negative split the 3rd km…and I think I smiled too. I’ll take it! It was great connecting with so many athletes today at this great event. Looking forward to seeing all of you (and others too!) next year.